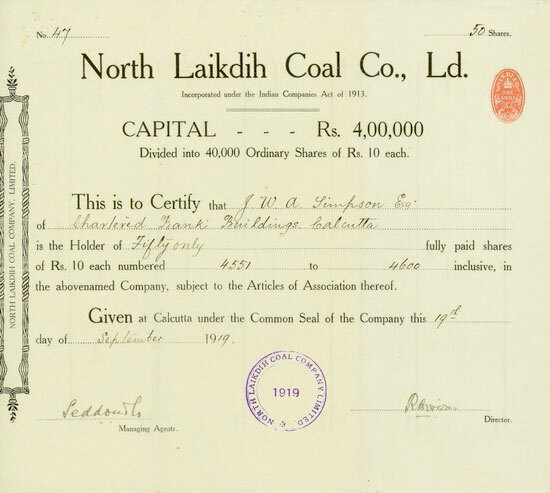 HWPH AG - Acciones antiguas - North Laikdih Coal Co., Ld. North Laikdih Coal Co., Ld. Calcutta, 19.09.1919, 50 Shares á 10 Rupees, #47, 25 x 27,7 cm, schwarz, beige, Knickfalten. Calcutta, 19 September 1919, 50 Shares á 10 Rupees, #47, 25 x 27.7 cm, black, beige, folds.